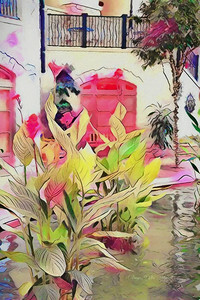 In this Gallery you will go down memory lane with me where I have created multiforms of art works and selected methods to harvest brilliant colors and effects to my original photography and virtual photography! Courage Does Not Always Roar Christmas At My Sister's Dallas Texas This little fellow is my precious Eskimo great-nephew! Although he was born in Alaska, his Mother is full blood Marshallese. Quite the unique and handsome young man that he is, I have followed him around taking pictures of his play times since he was born. 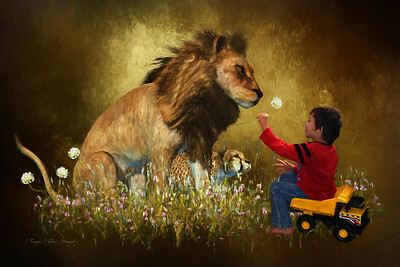 I created this fantasy fine arts painting for his Dad, my favorite nephew, Chris! 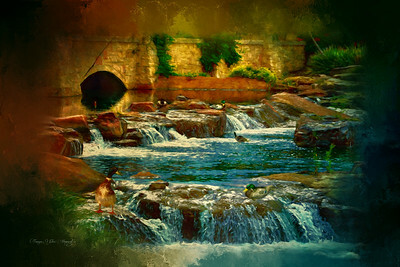 Digitally Painted from original photo! 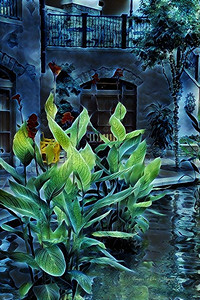 River Rhapsody C Gaylord Texan Resort Grapevine, Texas The 3rd of my special effects! Digitally Painted from my original photo! 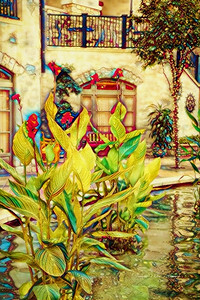 River Rhapsody (b) Gaylord Texan Resort Canal River Walk Grapevine Texas Digitally Painted from my original photo! 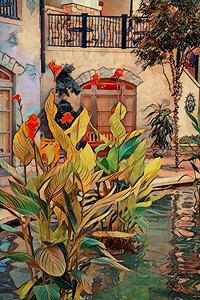 River Rhapsody D Gaylord Texan Resort Grapevine, Texas Digitally Painted from my original photo! 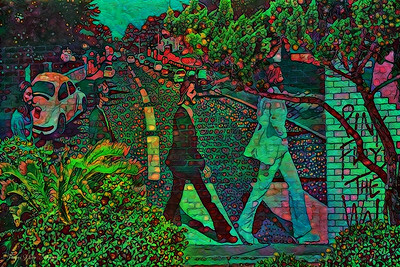 Flash Back Abbey Road Mural ~ Galveston, Texas Yep, I just had to do a little hippie-style photo effect to this shot! Digitally Painted from my original photo! Bringing Back Memories Wynnewood Village Oak Cliff, Texas When summer finally sizzled away, a long afternoon in Oak Cliff bouncing from doctor’s offices to clinics for an assignment was well spent. My favorite chaperone draped across my shoulders; thank goodness, photo op here I go! Just as I wisped past a very weathered double staircase looking to have formerly led onto a veranda style porch, I wondered if this esthetic building may have been someone’s home or an entrance to a hotel years back. Once completed with my visit, I shot around again to take the picture that kept tugging at my heart where the vintage iron fence and ivy created a story in my mind. I noticed there had been a fountain in times past and someone had left a wreath neatly encircling an old tree stump. Perfect! I laid it on top of the steps and perched to take my shot! The scene was alive with new and old and in a single moment I wanted to know if anyone else can have the feeling of “bringing back memories” that I just had! And...I believe that's either poison oak or ivy there! Digitally painted from my original photo! Delicious Afternoons Gaylord Texan Resort Waterfalls Grapevine, Texas If you look close enough, there’s an epic narration persisting in a natural behavior surrounding the grounds at Gaylord Texan Resort! 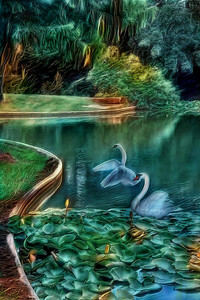 The terrain sets a stage for observing Mother Nature and her creative scenery with birds and ducks showing off in the waterfalls and entry ponds. I spend time wondering around different quarters when I’m there to shoot different spots I may have missed before. 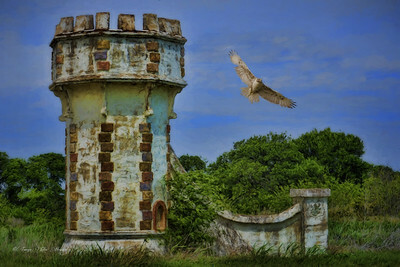 Whether you are taking pix close up or at a distance, you are sure to be pleased with what you take home in your camera! Digitally Painted from my original photo! Lake Charles, Louisana During Hurricane Harvey I had to make a trip to rescue my nephew from the floods. Six trips back and forth across the Lake Charles I-10 bridge is where this old rickety house caught my attention. I told him I would find that house to take photos of before we left! 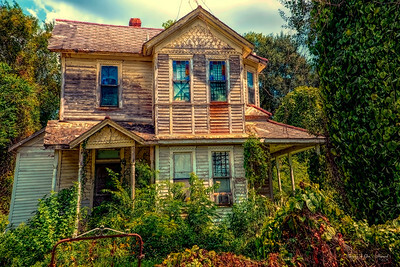 I finally made my way down and round to find this rickety old house among the moss and vines! 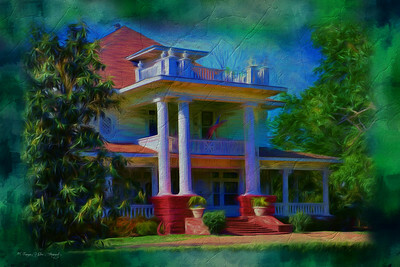 I love old homes like this because it reminds of me growing up in the good ol’ USA where our yesteryears still stand. Digitally Painted from my original photo! Moore Ventura Bed & Breakfast Ennis, Texas Texas Historical Landmark Member of the Texas Bed & Breakfast Association While you might want to visit Ennis for their Bluebonnet Trails, Ellis County Museum, Gingerbread Home Tour, Polka Festival or surrounding events you are most likely to spend a night or two, right? 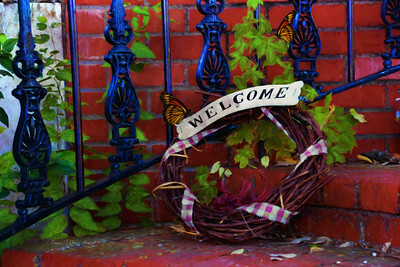 My choice is to unpack my duffels and secure a cozy stay at Moore Ventura Bed & Breakfast. Just stepping your first foot on the porch persuades you to stick around for more of all they offer beyond that cushy bed! 1905 was the building year for this outstanding Neoclassical Revival home. Start the morning with an elegant experience including a 2-course gourmet breakfast selection along with sipping the local based “Buna Bean” coffee. You may never leave the house once you discover its country charm throughout the garden, patios, kitchen, reading room and opulent Victorian clawfoot bathtub! Digitally Painted from my original photo! Sugar Ridge Road Ellis Bluebonnet North Trail The lifestyle in this part of Texas brings peace and tranquility to heart. The feeling of kicking back howls amid the wind and winding country roads. Makes you want to move from the hustle and bustle of city life and get back to nature! Digitally Painted from my original photo! Moore Ventura Bed & Breakfast Ennis, Texas Texas Historical Landmark Member of the Texas Bed & Breakfast Association Here’s a nice view of a befitting casual patio and garden area just off the main entrance deck of Moore Ventura Bed & Breakfast. I truly believe if you stay here a couple of nights you’ll feel the rewards of a well deserved escape from a normal day’s journey in life! 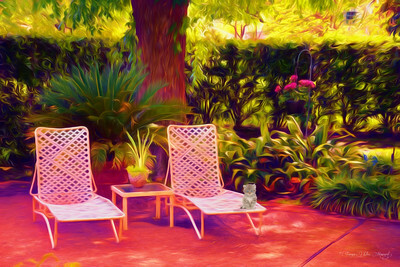 The garden is perfectly maintained and calls your name to come sit quietly and enjoy the silence! Digitally Painted from my original photo! Scarborough Renaissance Festival Waxahachie, Texas Just before the Scaroborough Renaissance Festival opened, my nephew and I spent some time in and around the fairgrounds. I fell in love with the castle gates at the roadside entrance and decided to do a painting with it! 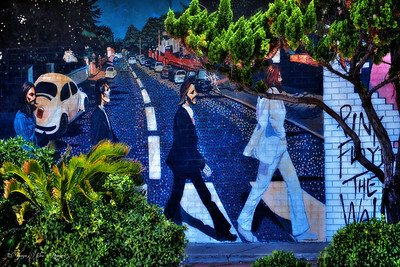 The original is on my TravelWITWIT Travel Blog. 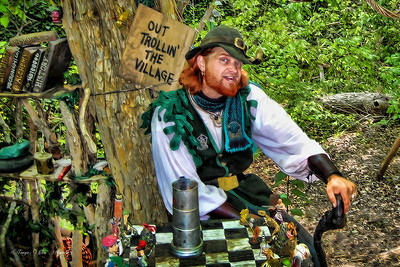 Visit TravelWITWIT to read more: Valorous Days At The Renaissance Festival! Digitally Painted from my original photo! Scarborough Renaissance Festival Waxahachie, Texas Most of the time when visitors line up for their tickets at the Ren Fair, there’s too much going on to get a great pic of the wonderful castle entrance. Luckily my nephew and I were there early for one of our recent trips and no one was in sight! 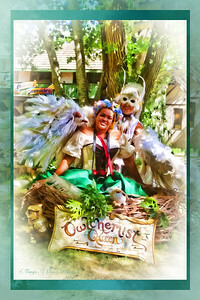 Visit my review and full blog at TravelWITWIT: Valorous Days At The Renaissance Festival! 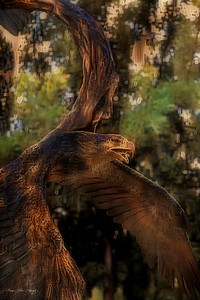 Digitally enhanced from my original photo! 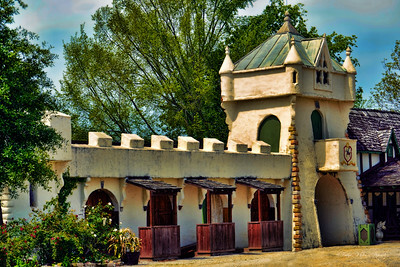 Scarborough Renaissance Festival Waxahachie, Texas When you think about Medieval times, one wonders off into fairytale land where Dragons glimmer the landscape with their breath of fire. 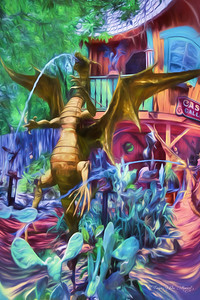 At the Ren Fair you may indulge your merry clan with oodles of dragons in all sizes and up to large statues spitting water. The shops at the festival always capture my heart and pocketbook! I can’t leave without a souvenir to relic my walls, neck or head! This photo was tough or me to work with. It would turn out all green or all gold; sadly without a focal trophy in the scene. So, once again, I decided to create a painting with it….no more greeeeeen! 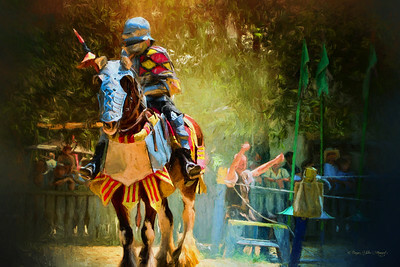 Click here to visit my review and full blog: Valorous Days At The Renaissance Festival! Digitally painted from my original photo! 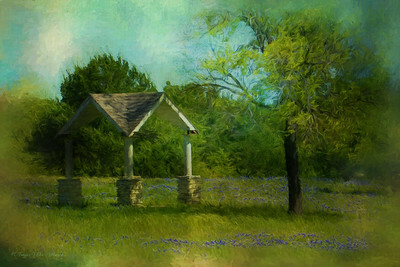 Bluebonnet Park Highway 287 ~ Ennis, Texas In search of the Ennis Bluebonnet Trails, along Highway 287 from Waxahachie, eye-popping blue florals and Indian Paint Brushes glazed chromatically just as we entered the boundaries of this quaint Texas town. Pulling off toward the right and up a hill we entered Bluebonnet Park which is part of the West Trails. The park rests peacefully next to Bardwell Lake (great for fishing) with picnic gazebos, park benches, play areas, walking trails, softball fields and good ole’ restroom facilities. This is an excellent afternoon hangout for families or anyone wanting to take photos! I wanted to create a painting from one of the picnic gazebos since it was such a serene and secluded section of the park. The bluebonnets bounced around the grass and covered fields beyond. Digitally Painted from my original photo! 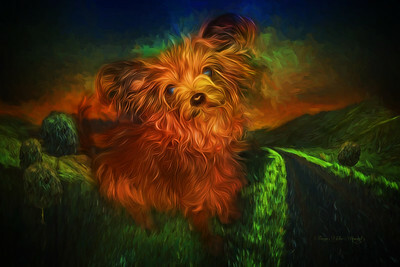 Looking For ToTo My Precious Little One! 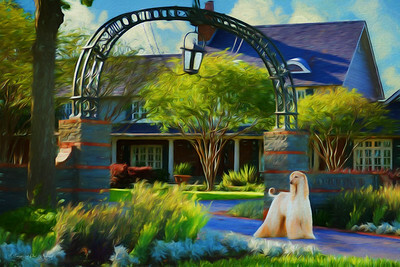 Corinth, Texas (Christmas at my sister's home) We all love our little precious doggies and pets. ToTo is going on 17 years old now and I wanted to do something special with one of her photos. I had a friend who wanted to buy the print and thought I would add it here to my site, too! Enjoy! Digitally Painted from my original photo! In search of the Ennis Bluebonnet Trails, along Highway 287 from Waxahachie, eye-popping blue florals and Indian Paint Brushes glazed chromatically just as we entered the boundaries of this quaint Texas town. Pulling off toward the right and up a hill we entered Bluebonnet Park which is part of the West Trails. The park rests peacefully next to Bardwell Lake (great for fishing) with picnic gazebos, park benches, play areas, walking trails, softball fields and good ole’ restroom facilities. This is an excellent afternoon hangout for families or anyone wanting to take photos! I wanted to create a painting from one of the picnic gazebos since it was such a serene and secluded section of the park. The bluebonnets bounced around the grass and covered fields beyond.